Apple’s share price has taken a steep tumble since rumors began to spread that the iPhone XS and XS Max weren’t selling well. Unlike past years, though, this time the rumors were right: the iPhone giant confirmed yesterday that it expects lower-than-expected sales for its newest line of iPhones. Markets that were already jittery over trade wars and a government shutdown heavily sold off on the news, pushing Apple’s share price down to $144 from a high of $233 in October. Apple CEO Tim Cook blamed soft sales in China, and it’s true that consumers aren’t exactly feeling flush as the economy slows and the US squeezes it amid a trade war. For sure, iPhones aren’t as popular in China as they used to be for all kinds of reasons, but there’s one in particular that stands out: WeChat. Ben Thompson, who writes the excellent Stratechery blog, wrote last year about how WeChat serves as a de facto operating system in China. WeChat does everything from chatting to ride-hailing, and games to e-payments. Because WeChat functions the same on Android and iOS, the underlying operating system becomes much less important. There is nothing quite like WeChat in the US, Europe, or anywhere, really. So it’s time to raise the curtain and demystify what it is, and why people in China are so addicted to it. WeChat is most often compared to chat apps, which are ubiquitous. The world has basically divided itself up by chat app, with Facebook Messenger leading the way in the United States, WhatsApp in the UK, Europe, and Hong Kong; LINE in Taiwan and Japan; Kakao Talk in Korea, Zalo in Vietnam, and I could go on. WeChat, of course, is the undisputed heavyweight in the Chinese market (the part that consists of Mainland China, not to be confused with Hong Kong and Taiwan which operate separately — but that’s a discussion for another day). It seems odd to compare WeChat to iMessage because they are fundamentally quite different, but there is one key area of overlap: chatting. iMessage is a secure and instant easy way for people using Macs or iOS to message each other over a data connection (blue bubbles) — the Messages app can fall back to legacy SMS (green bubbles) otherwise. iMessage offers all the messaging staples like stickers, location sharing, audio messages, video chat (via FaceTime) and some neat effects when sending particular messages (try typing “Happy New Year” to a friend). Apple has gotten a little more creative with Animoji and Memoji of late, but it’s anyone’s guess as to whether these will catch on or be forgotten. There’s also the iMessage App Store, which extends iMessage’s functionality and makes sharing key data much easier. WeChat does all of this, with the exception of Animoji and Memoji. Even so, this is barely a fraction of what the app is capable of. Let’s start with messaging, while we’re on the topic. When you download and install WeChat, you’ll select a “WeChat ID” that is basically set forever. This functions as your permanent identity on the platform, but you’re free to change your account name as often as you like. WeChat doesn’t have a real name policy, by the way. Ironically, WeChat really took off as a voice messaging rather than text messaging platform. To this day, it’s common to see Chinese people walking down the street or sitting in train stations holding the bottom end of their phones (where the mic is) to their mouths and giving a monologue. Then you’ll see them put the phone down, wait a while, then raise it to their ear to hear the reply. Things like photo sharing, video chats, emoji, stickers, and the rest are table stakes at this point, and WeChat has all of them. There are a couple of neat functions worth mentioning, though: first, instant translation. If you receive a message in Chinese, give the Chinese text a long press until you see options appear, then tap “Translate”. It works from Chinese to English and vice versa. Second is cash transfers and “red packets”. WeChat actually stores money for users, making it a popular way to send cash around when dividing up the dinner check or helping out a girlfriend. In short, it’s basically Venmo. The unique part is the “red packet”, which is a Chinese tradition. I won’t give a full cultural lesson here, but physical red packets are handed out to friends and family at Chinese New Year and major occasions like weddings. Aside from this, WeChat holds its own with all the other leading chat apps in the market. Now imagine if you rolled Facebook’s news feed into WeChat. In English, this feature is called “Moments”, and if you tap it you can can scroll through posts made by your friends that can include links, text, photos, and video. Just like Facebook, you can “like” the post or leave a comment underneath. Moments works like Facebook’s news feed, with the ability to post and comment. WeChat does one key thing differently from Facebook, though, and that’s hide any comments from people you aren’t personally connected with on the platform. If I post something to Facebook and friend A comments on it, friend B will see friend A’s comment even if they don’t know each other. WeChat will only show comments among mutual friends. Whether this is a pro or con is up for debate. If you’re in an airport or on a bus and see a person of Chinese descent randomly scrolling through their phone, there’s an excellent chance they are going through their Moments feed. Yeah, it’s true, though probably not as popular as it once was. Look around and see who might be nearby and ready to chat. WeChat Pay is *massive*. It’s used by more than 800 million people in Mainland China and continues to grow, forcing cities around the world to adopt the technology to cater to Chinese tourists. When I visited the US last summer, I was surprised to find WeChat Pay accepted in New York taxis and in San Francisco gift shops were even Apple Pay wasn’t taken. It’s important to put WeChat Pay in context — China developed late, so credit cards never really took off there. Like the landline telephone, China leapt right past credit cards and into e-payments, which are already ubiquitous. People go many days in China without ever touching paper money and acceptance of WeChat Pay is extremely widespread. Most street beggars, buskers, food stall chefs, and taxi drivers take WeChat Pay, which is used for both in-store and online payments. WeChat also serves as a device platform in its own right. 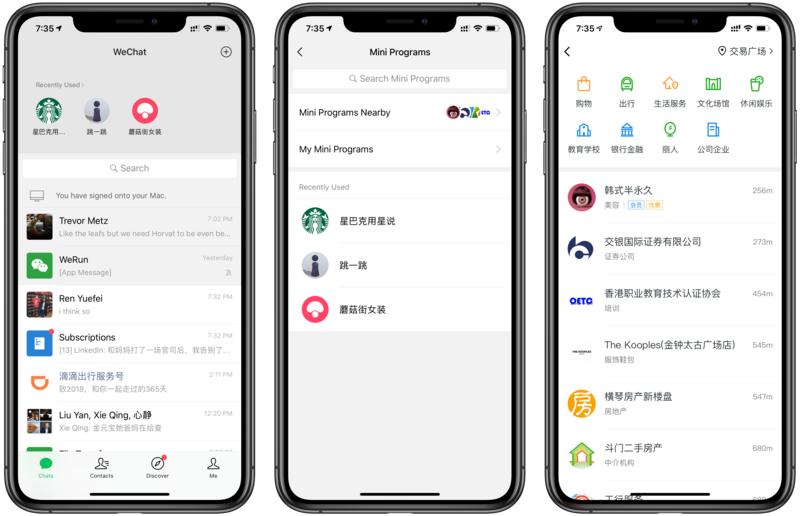 In early 2018 it rolled out WeChat “Mini Programs”, which are small apps that can be downloaded directly into WeChat. Mini Programs can be found by tugging down on the screen with a list of active chats. It will reveal a drawer at the top that shows the user which Mini Programs are installed, along with some recommendations for Mini Programs nearby. There are now thousands of these apps on every topic imaginable. Companies like Starbucks have launched Mini Programs to order coffee and buy gifts, while Dianping (China’s Yelp) helps users make restaurant reservations. There’s also no shortage of games. Another area that’s getting a lot of attention is investing. Right from within WeChat, users can buy financial products, something that’s also more easily done in countries with lighter-touch regulations. Of course users can also use WeChat to hail a taxi and then pay the driver. Users can install Mini Programs from within WeChat. Then there are all the other things, such as the ability to pay parking tickets, book a doctor’s visit, call an ambulance, pay your electricity or water bill, book a flight ticket, buy a train ticket, reserve a hotel room, donate to charity, rent a bicycle, and a whole lot more. I am not even close to including everything WeChat does here, but you get the idea. I’ll just touch on this one, as it’s geared towards people tasked with running social media channels on behalf of companies or other organizations. WeChat offers company accounts, giving brands the ability to post content, just as they would on Twitter or Facebook. But there are a few wrinkles with WeChat. First, there’s not really a character limit like you see on LinkedIn, Facebook or Twitter — that means there is a lot of room to include images, infographics, and all kinds of other material in article-length format. Second, Tencent (the company that owns WeChat) permits the publication of what are called “H5 Campaigns”, which are basically mobile websites (using HTML5, obviously). This creates all kinds of room for some creative, targeted campaigns. The platform also has several APIs that allow integration with several other tools, like chatbots or on-demand content. This can vastly boost the capability of a given company’s WeChat account, customize it, and make it a more comprehensive tool with a richer set of possibilities for brands than social networks elsewhere. Now for the other side of the story. The idea of privacy, or demanding some level of transparency regarding the use of your personal data, is almost unheard of in China. …when you meet someone in China, it’s not just common, but expected for that person to ask about just about every detail of your personal life. Even more so if the person is older than you. “Everybody just asks, what is your salary? Are you married? When will you have kids? Why haven’t you had kids yet? Where do you live? Why did you change your job?,” Zhang [Weining, an associate professor at Cheung Kong Graduate School of Business said]. I lived in Mainland China for several years, and can absolutely vouch for this. I’ve been asked detailed, personal questions by complete strangers… a lot. With this is a cultural backdrop, it wouldn’t be wise to put too much sensitive material on Chinese social networks (though these days, it’s probably not wise to put sensitive material on any social network, period). Last but not least, despite WeChat’s ubiquitousness, there’s some anecdotal evidence that it’s beginning to lose some of its momentum. WeChat was an absolute sensation when it was released in 2011, but like Facebook, once your parents are on it, it’s not quite as fun anymore. Many people tell me it’s become a business tool, with people sharing WeChat IDs or scanning QR codes at networking or work events. With so many professional contacts on the service, some people have begun sharing updates on Moments less frequently. This shift could open the door for a younger, more fun and innovative upstart in the Chinese market. There are many of these out there already, but none have taken hold in a big way. Apple is definitely facing strong headwinds in China. It’s a unique market that is mostly closed to foreign companies in sensitive sectors, has a government that is particularly aggrieved because of the trade war, is seeing its first economic slowdown in decades, and boasts a population with strong nationalist tendencies. Even if Apple is able to overcome all of these factors, there’s still Chinese technology to contend with — and with the deep pockets of Tencent and Alibaba, Apple’s going to have to set the bar even higher if it hopes for sustained success in China.